If playing an instrument is something you've always wanted to do, but you've shied away from actually putting in an effort or you simply don't want to build up calluses, you may want to ready your trigger finger. Before you know it, you could find yourself playing in the next big barcode-scanning band. No, seriously--you may actually be able to create music by scanning barcodes in the future. Korean designer Ha Lim Lee, along with graphic designer Woo Jin Kanh, have managed to design instruments and create a whole new genre of modern music by using scanners to compose music. By scanning the instrument barcodes, you can play back predetermined tones one after another, compiling the guitar, drums, and cymbals into brand new tracks. It sounds kinda bizarre, but you really do have to see it to believe it. What's even cooler is that this isn't just a one scanner kind of band. 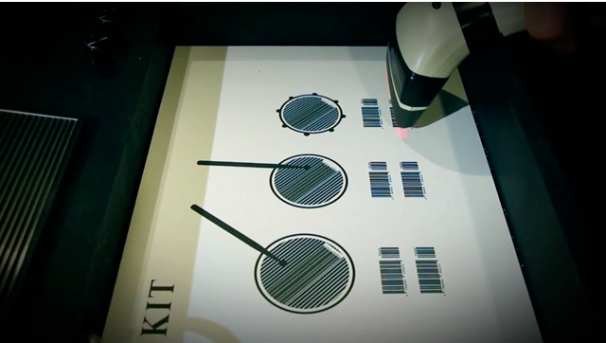 Instead of having one person set up the tracks one be one, instrument by instrument, the Barcode Band can use multiple scanners so that multiple people can play along. The only thing we need at this point is something to create a drop barcode and we could easily make ourselves a Skillrex Barcode Monster.